Today is Ada Lovelace Day, the annual celebration of women in science, technology, engineering and maths. I try to write something for Ada Lovelace Day every year, but I don’t always manage it. Four years ago, pressed for time, I just blogged a list of all the unique and inspiring women who I’d worked with in the domain of educational technology since 1997. Looking back on the list now, it’s sobering to reflect how many of these women have now left the field, moved into other domains, or sadly passed away. Julie Allinson, Helen Beetham, Kerry Blinco, Rachel Bruce, Joanna Bull, Gayle Calverley, Jackie Carter, Lisa Corley, Sarah Currier, Jenny Delasalle, Susan Eales, Suzanne Hardy, Rachel Harris, Rachel Heery, Nancy Hobelheinrich, Sarah Hollyfield, Allison Littlejohn, Sheila MacNeill, Sue Manuel, Moira Masey, Lisa Mattson, Mhairi McApline, Sarah McConnell, Lou McGill, Celeste McLaughlan, Liddy Neville, Solvig Norman, Chris Pegler, Sharon Perry, Sarah Porter, Jean Ritchie, Tish Roberts, Laura Shaw, Christina Smart, Amber Thomas, Li Yuan, Su White, Lara Whitelaw, Heather Williamson, Vashti Zarach, Linn van der Zanden. Many of us are still hanging in there, and of course I’ve been lucky enough to work with many more inspiring women since creating this original list, but there’s no denying that the last four years have been tough for everyone working not just in educational technology, but in academia more widely. However if the last few years have taught me anything, it’s just how resilient, creative and adaptable my female colleagues* can be when it comes to facing the continued uncertainty that is afflicting the sector. To my mind, nothing illustrates this adaptability and creativity better than this picture. This lovely art work is by Lou McGill, who I first met many moons ago working on a Jisc funded Digital Libraries in the Classroom project at the University of Strathclyde. Lou worked on a number of Jisc funded projects before taking up a post as Programme Manager with Jisc itself. Some years later Lou left Jisc and she now works as an education technology consultant and runs her own art gallery, Life’s Little Ironies, in Whithorn. I had the pleasure of catching up with Lou recently at a pop-up gallery she ran at the Wigtown Book Festival, we talked about everything from education technology, to art, to local history and I came away with with this lovely art work and, perhaps more importantly, lots of good ideas. Many of the women listed above have gone on to achieve wonderful things both in and beyond the domain of education technology and that is certainly something to celebrate. *To be fair, my male colleagues have had it just as tough, and have had to be equally creative and resilient to survive. Respect to them too. This entry was posted in Women in Tech and tagged adalovelaceday, ALD13. Bookmark the permalink. It certainly was lovely to catch up with you Lorna. Although linking virtually allows us to work collaboratively and keep in touch, it was refreshing to catch up with you in person. Just a brief chat with you is inspiring so here’s to future creativity. I am very honoured that you have featured me in your Ada Lovelace blog post.and agree that resilience and creativity are what we need to survive and thrive in these tough times. What a fab list (I remember that earlier blog post) of inspirational women. 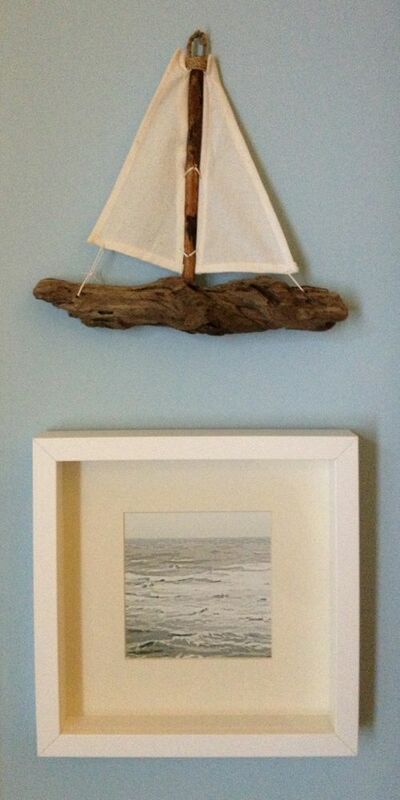 It’s great to see your print in situ – set off so well by the blue wall and the wee boat. Thanks so much for supporting our new gallery.